Again CitrixTools.Net developed some new utilities, so we are ready to review them and write part 4 in the glance at free section of CitrixTools.Net. In this part we will take a look at the XenApp Application Maintenance Manager, XenApp Policies Export Manager and RDS Session Utilities. The Citrix consoles offer the possibility to disable an application for example when there is maintenance on the back-end of the application. Unfortunate the user is not presented with a nice message only that the application is not available. In this space Application Maintenance Manager utility steps in. With this utility you can place an application in maintenance mode in such way when the user wants to start the application a message is shown that the application is not available. 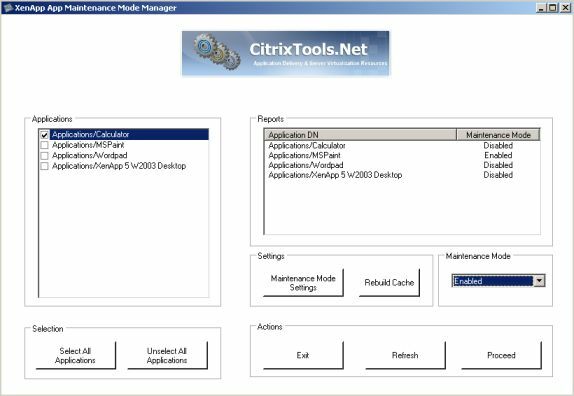 To accomplish that you need to install the Application Maintenance Manager on one or more Citrix XenApp servers. The installation is a single executable with straight forward installation steps. After the installation you need to start some small configuration settings available within Maintenance Mode Settings. There you need to specify on which Citrix XenApp Servers the utility is installed (on these server the executable will be started showing the message to the end-user). When an application will need to be placed in maintenance mode you start the utility again select the application on the left side, select Enabled on the maintenance mode and as last the proceed button. 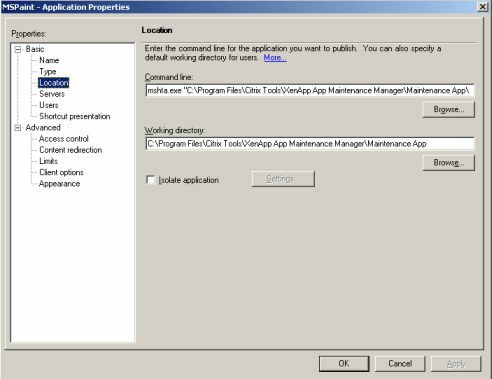 What the tool is actually doing is changing the location of the executable of the application to the Application Maintenance Manager utility so the message will be shown. When maintenance is done the application is selected again in the utility, the maintenance mode setting is set to disabled and the original executable is place back in the Citrix Published Application properties. The message text is available as a text file so can be adjusted to your needs if needed. The functionality of the next utility is already described in another Glance at Free utility article Import Export CPS Policies. Unfortunate the tool described in this article is not really maintained and did not have a graphical user interface. Pierre created the XenApp Policies Export Manager to provide the same functionalities. After a simple installation (like all other CitrixTools.Net utilities) you can start the application. On the left side the available policies will be shown and you can select the policy or policies you would like to export and you need to specify a file in which the settings are exported. All selected settings are stored in a single file. When you would like to import a policy you select the file and the utility will show which policies are available for importing and you can select which policy or policies you would like to import. The last tool in this article is called the RDS Session Utilities, which can be used in both Microsoft RDS as Citrix XenApp infrastructures. This utility adds several new additional features to your Terminal Server farm. In comparison with the other CitrixTools.Net the utility has a different interface. You need to install the RDS Session Utilities software on all servers, where a service will be added. The next step is to add the ADM template to your Active Directory so you can configure the features available within in the RDS Session Utilities. Fast Logoff: Enabling this feature arranges that a session is disconnected when the logoff event is received. For the end-user the logoff process is quick, while on the background on the server the full logoff sequence is being processed. This functionality is similar offered by some commercial product like RES Workspace Management (formerly known as PowerFuse). You can exclude groups in this process if needed by a setting in this GPO. Maintenance Mode: This functionality is comparable with the just discussed Application Maintenance Manager but then for Desktops. With the maintenance mode you can warn users that the server is not available for maintenance, if needed you can create your own maintenance message application. Misc Utilties: With this part adds several new variables based on the client ip-adresses, client name and client protocol. In comparison with the standard variables these variables are updated when a user reconnects, so these values correspondent the actual information instead of the initial information from the initial connection. These variables can be used for script to configure settings different like another printer. The task for reconnection can be specified within the same ADM file. This functionality is comparable with ReConnAct by Immidio. With this new set of utilities Pierre Marmignon is extending the possibilities of SBC infrastructures even more. Personally I like the Application Maintenance Manager a lot, because this is a struggle for many IT department (at some of my customer we are using the same functionality in PowerFuse a lot). 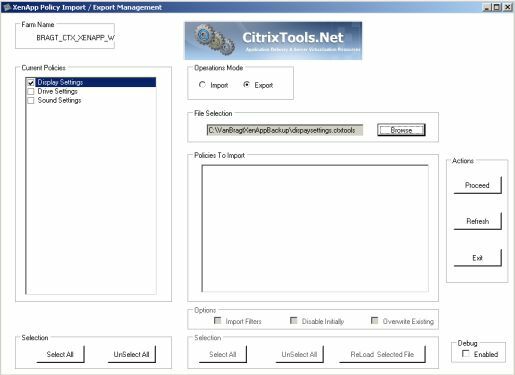 It also good to see that the Citrix policies export/import functionality is maintained by Pierre (while the other solutions are not updated anymore), so we are sure that updates will be provided to such functionality. The RDS Session Utilties also offer functionalities that can be very useful for several companies. Some of the features are also available in other freeware utilities or commercial products, but combined it is a nice set again.